The Breeders Cup (official site) is taking place at the Churchill Downs Racetrack in Kentucky this year, with the two-day culmination of the horse racing season taking place on November 2nd and 3rd. There are 5 races set to take place on Friday, with the remaining 9 championship races taking place on Saturday, capped off with the massive $6,000,000 Breeders Cup Classic that is set to take place at 5:44pm EST on the Saturday. All-in-all there is $30 Million in purses and awards to be handed out over the two day event and you can watch the all of the action unfold on NBCSN in the United States, with the fain races, including the Class moving over to NBC from 3:30-6pm for the finale. There are 14 races in all at the 2017 Breeders Cup and this article will provide you with a step be step guide to betting on any and all of the races, including the Breeders Cup Classic. First I will include a schedule of the races with post-times, so that you don’t miss a race, and ensure that you get your bets in on time, and then I will provide a 3 step guide for betting on this years Breeders Cup Classic online at our top rated betting site, BetOnline.ag. All of the times below are in Eastern Daylight Time. If you’re new to betting online, follow this simple 3 step guide to get your bets in on this years Breeders Cup. First you will need to open an account with an online sportsbook. BetOnline.ag is our top rated sportsbook, and we recommend them for customers from around the world, including the United States. 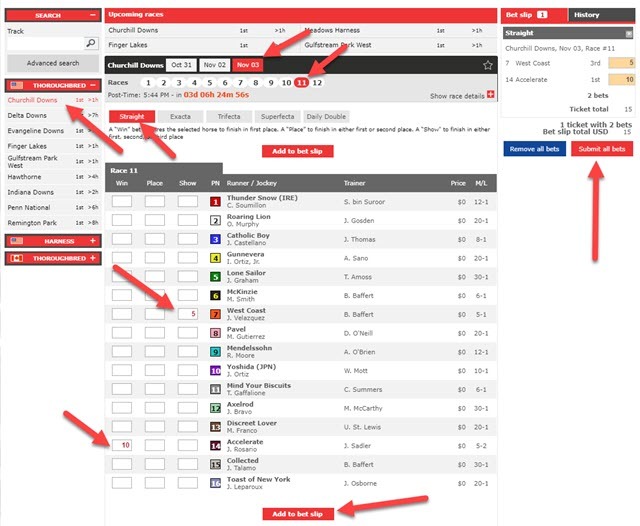 BetOnline has a very easy to navigate racebook and even offers all of their players a $25 rebate if your first horse racing bet isn’t a winner. This is on top of the Welcome Bonus, and the 7% horse racing rebate they offer. Next you will need to deposit in order to get the funds online that you wish to bet on the Breeders Cup. BetOnline accepts Visa, MasterCard, bitcoin, other cryptocurrencies, Skrill, Neteller, bank wire and more for deposits and withdrawals. The Welcome Bonus is currently a 50% matching bonus up to $1000 on your first deposit. Now it’s time to place your bets! The BetOnline racebook is taking bets on all of the Breeders Cup races all week long. Select ‘Horses’ from the top navigation bar, and then selecting ‘Churchill Downs’ under the ‘American Thoroughbred’ drop down menu. Select the date and the race # or post time for the race your are looking for. The Breeders Cup Classic is race #11 on November 4th and has a post time of 5:44pm. Next select the type of bet you want to make (straight, exacta, trifecta, etc) and enter your wagers. Click ‘Add to bet slip’ and once you are happy with your card click on ‘Submit all bets’ to lock them in. It’s important to remember that the odds for the bets placed through the racebook will move depending on the amount of money coming in on each horse that day. Check out our horse race betting page for more information about the bets you can make on each race, and our dedicated Breeders Cup page for a more detailed look at the race.